This is a pancake that you bake in the oven. It is fun, poofy, and automatically forms a middle custard layer! 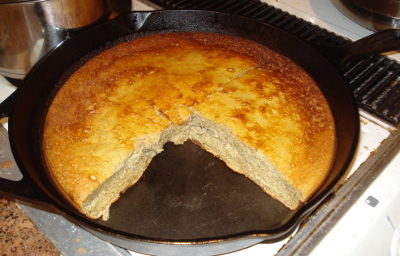 Unlike some other skillet pancakes, it does not deflate much if stored in the refrigerator and works great as leftovers. Turn on oven to 400 degrees. Put a seasoned, 12-inch, cast iron skillet in the oven. Now is the time to consider a "theme" for the egg baby. We sometimes substitute a 15 ounce can of pumpkin (or other squash) for one of the cups of milk, and use more ground cinnamon and nutmeg to make a pumpkin pie flavor theme. Other times we use fewer spices and later, after the main blending, stir in a cup of frozen blueberries. to make a blueberry muffin flavor theme. If you own a normal blender, pour half the blended wet ingredients into the mixed dry ingredients. Stir. Pour in the other half and stir again. Move the skillet to the stove and spread the butter on its inside sides and bottom. Pour in the mix. Turn off the burner. Increase the oven temperature to 475 degrees. Bake about 27 minutes.